This Spring we discovered a local hydroponic u-pick farm, First Fruits. The farm is just a few neighborhoods over from ours, right in the middle of the most densely populated county in Florida. We couldn't believe our luck and took advantage by picking produce there nearly every weekend! 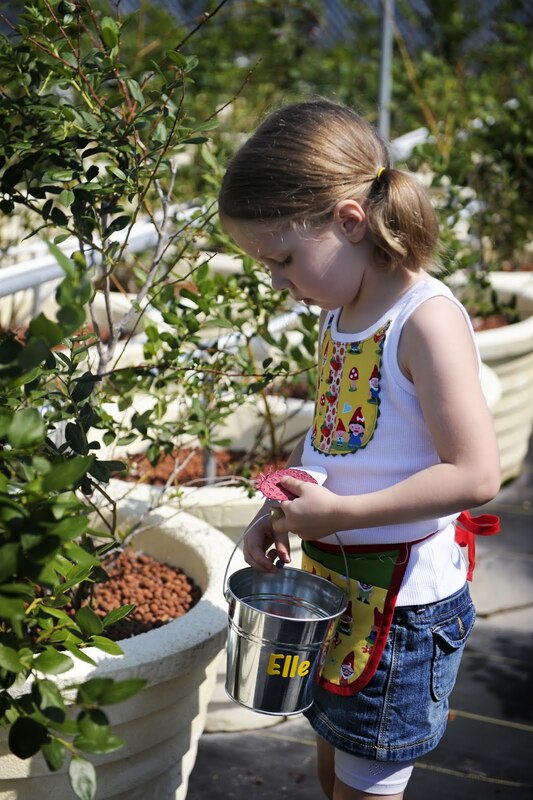 My Elle talked endlessly about how much fun picking was and how she thought that her friends would like it too. 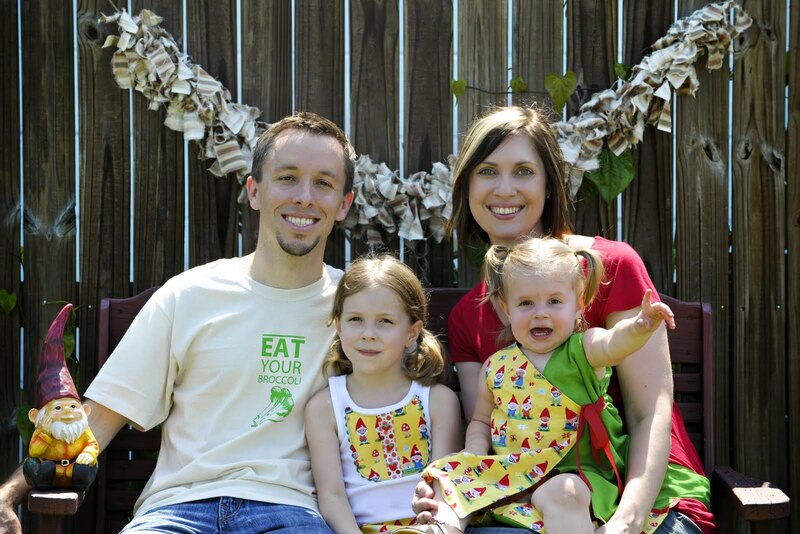 I knew it would be a great experience for the kiddos, something the parents could get excited about too, and would be an opportunity for us to support locally grown food, which we've always been advocates of. So of course a birthday party came to mind, but my Elle turns 6 in October when the farm is closed... so celebrating the end of the school year was as much of an excuse as we needed! I wanted an organic/natural feel for the party and the invites rethink ink made for me with hand drawn illustrations, craft paper envelopes, and seed catalog liners set the tone perfectly! Since we would be in the Florida sun for the entire party, I decided to host it in the morning, which made for a little cooler day and a kid friendly breakfast menu. The decor for the kid's sit down breakfast was my favorite part of the party! 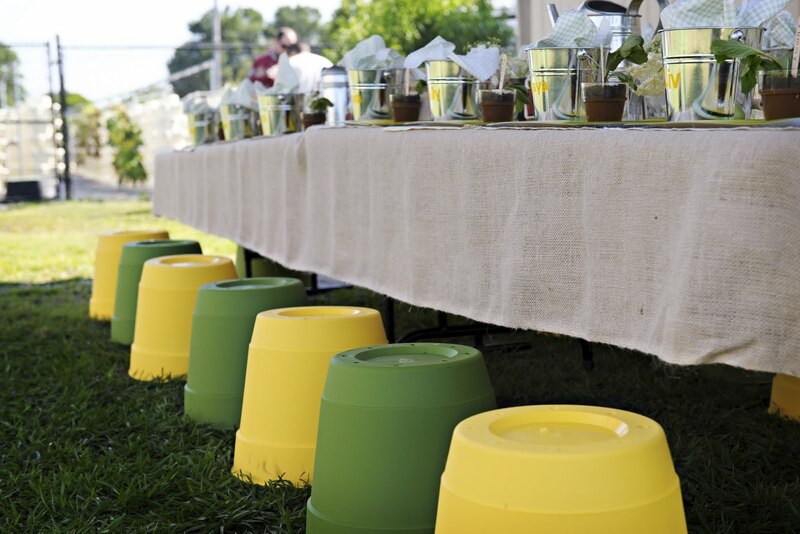 I set up two 6' kids tables under a tent, over turned plant pots as stools in alternating green & yellow, a vintage seed packet banner strung along one long side of the tent, & a gathered burlap and lace garland along the other (tutorials on each of those to come!). 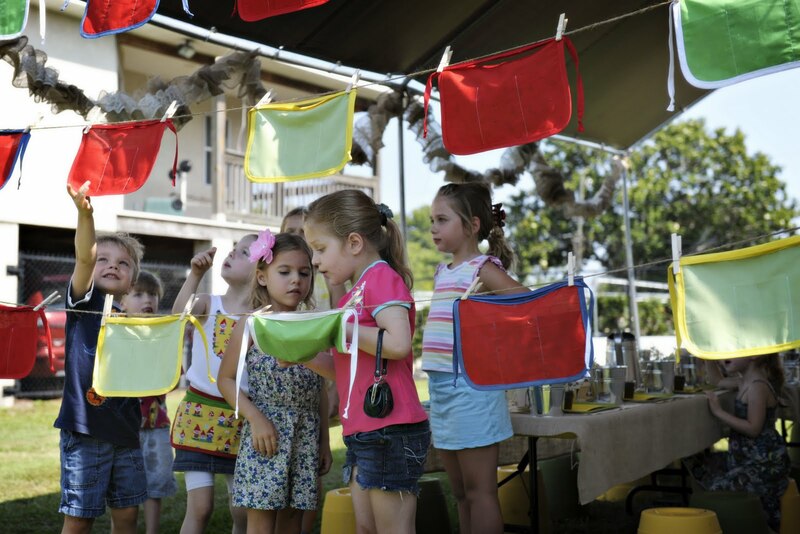 One short side of the tent was closed off by a "wall" of kid sized gardening aprons I made for each of our guests, hung on twine clotheslines with little name tags attached with the cutest miniature clothespins. The tables were covered in burlap, with a row of vintage doilies down the center (I bought the doilies from Our Attic on Etsy and realized when I received the package in the mail that they're local!). I picked up the green and yellow square plates and the watering cans we used as water pitchers at Ikea. I found the glass jars with the metal latch lids for apple sauce at Goodwill, along with the silverware spoons I used at each place setting, and the parfait glasses I filled with whipped cream. 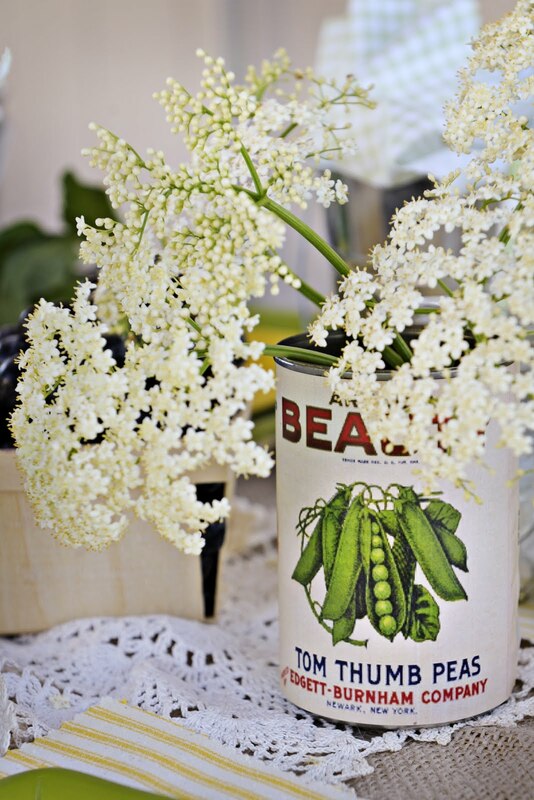 Also on the tables were vegetable cans re-labeled with vintage can labels and filled with pretty white flowers I stole picked from a tree on the property next to the farm, a burlap lined basket I found at Home Goods, and old fashioned wooden berry baskets I bought from Sugar Camp Cottage on Etsy. Each place setting consisted of: a place mat that was really just pretty yellow ticking I found at Jay's Fabrics and cut with pinking sheers. The square Ikea plates. A real spoon (not to be confused with a plastic party ware spoon). A canning jar with a bit of twine & a green stripe paper straw from Isa Kay Boutique. A scallop edge napkin I bought at an online party retailer. A galvanized berry bucket I picked up at the dollar bin in Target, personalized with the custom vinyl decals Lime Tree Gifts made me, and lined with green gingham fabric I cut with pinking sheers. 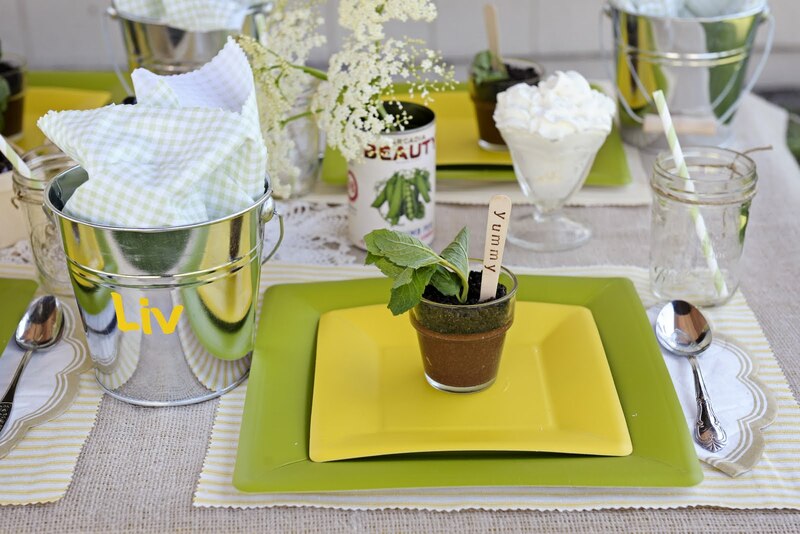 And last but not least, the adorable Martha Stewart project - chocolate pudding, Oreo "dirt", mint leaf "plants"... I love me some Martha! I added a wood spoon/plant stake I stamped with "yummy"
The menu consisted of blueberry (picked from the farm of course!) muffins, apple sauce, fresh berries and whipped cream, and pudding "plants". 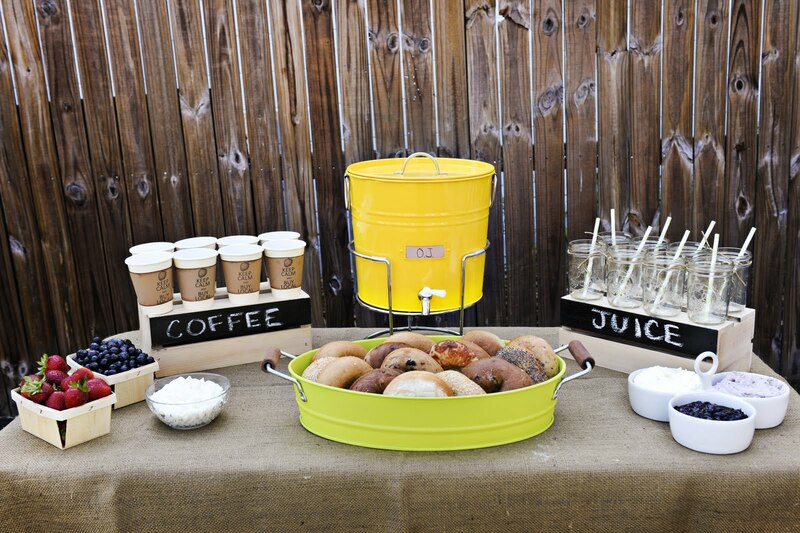 I did a separate table for the parents with bagels, coffee, OJ, and fresh berries. 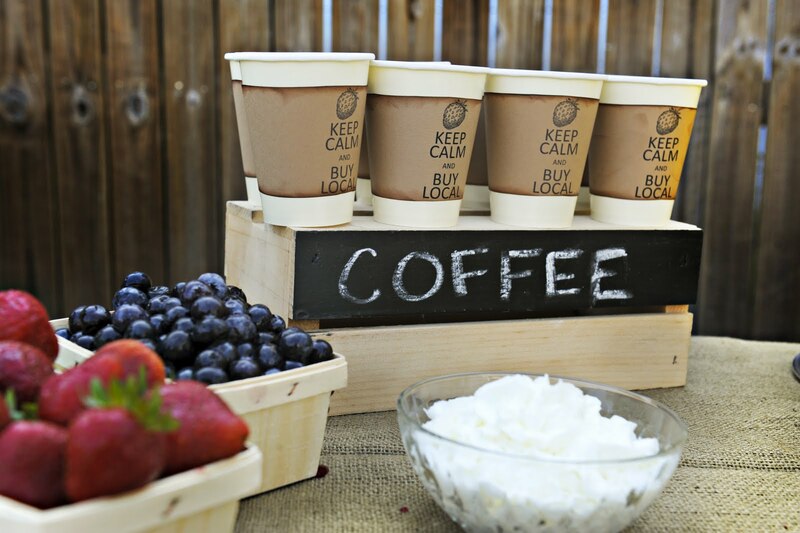 My favorite project for the party has got to be the coffee sleeves I made "Keep Calm and Buy Local"! After everyone ate breakfast, Shelly, First Fruits' owner extraordinaire (along with her darling husband Jeff & super sweet and especially helpful children), told all the kiddos what was growing on the farm that day and what to look for when they were picking. 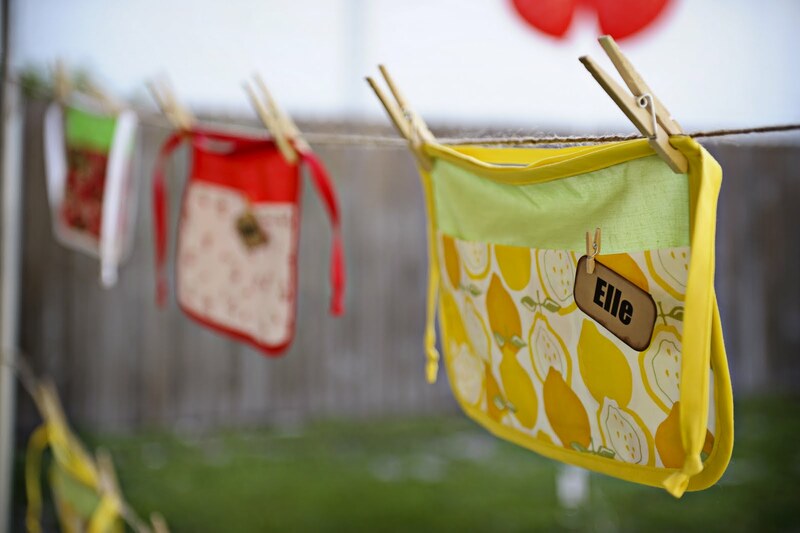 Elle gave each of her friends the aprons she had chosen for them, a pair of kiddie scissors, and they all set out into the farm with their berry buckets to pick. While everyone was picking, I cleared the table and re-set it for strawberry shortcake making. 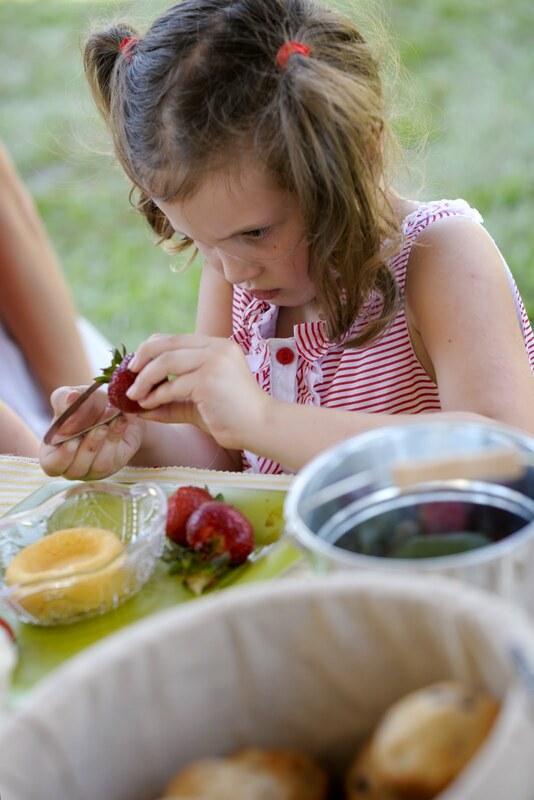 When the kids came back in from picking, they found 4 strawberries, a strawberry huller (I found those good ol' fashion metal squeezy ones at Montessory Services), and a bowl with a slice of pound cake at their place setting. They hulled the strawberries, cut them with a strawberry slicer I borrowed from a friend, and topped it with whipped cream. While the kiddos were making their strawberry shortcake I bagged the produce they had picked in Ziploc bags, and tied it with the gingham liners before sticking it back in their personalized bucket. 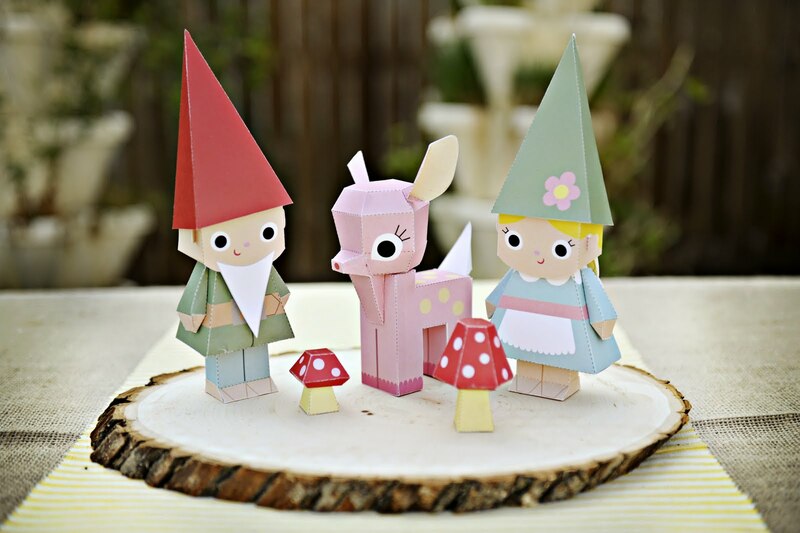 They each went home with their bucket of pickin's, a strawberry huller, their gardening apron, and an envelope of these adorable paper craft gnomes (a boy gnome for the boys and a girl gnome for the girls) to make at home. can you even get over how stinkin' cute these are?! I was literally... I'm serious about this... jumping for joy when I found this set in the Fantastic Toys shop! My very patient and precise husband cut, folded, and glued these for the party so everyone could see just how adorable they are... yes I am that lucky... a good Daddy a sweet husband and he can craft too! 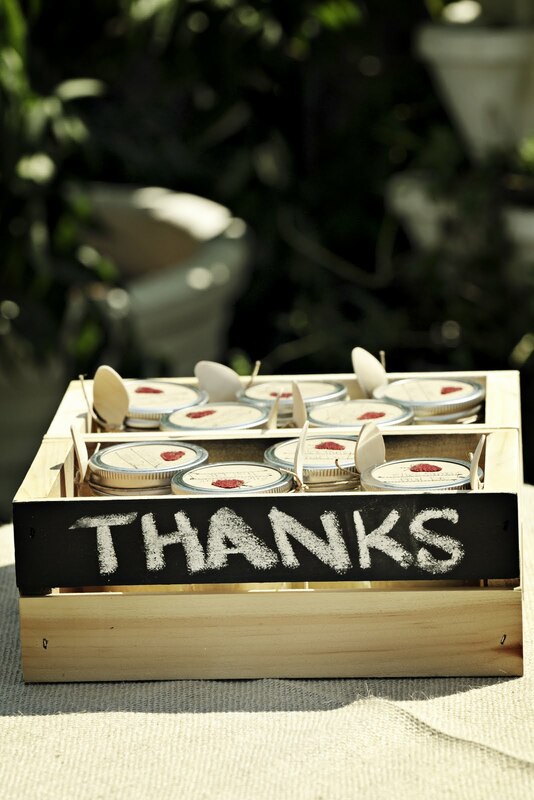 At this age, the parents are just as much part of the party as the kids though and I didn't want to leave them out, so I sent them home with a quilted mason jar of fruit dip, topped with handmade labels with little felt strawberries that Mud & Twig made, and a wooden spoon stamped with "thanks" tied on with twine. It was such a fun day and I owe a great big giant thanks to lots and lots of people! I linked to a bunch of them above, please please take some time to check out these wonderful vendors! I put tons of effort into hunting down. And also my amazing photographer, Dawn of Elemental Image... I'll never stop talking about how worth every penny it is to have someone capture the special moments of the party and all your hard work! Having Dawn there let's me focus on being a good hostess and having a great time with my family, which despite how wrapped up in the details I get, is actually the point of the party! I also know just how valuable having someone to bounce ideas off during the planning process is... my good friend Karie never acted like my incessant questions about the most minute details were ridiculous (despite what she may have been thinking ;)), was a huge help the morning of the party setting everything up (along with my Aunt & Shelly's daughter, Kelly), and did so much to help make that day run smoothly. Thank you all for being patient with me, making my vision a reality, and not calling me out on being the party equivalent of a Bridezilla!! My Elle's first year of "real school" was such a great experience and a fun milestone, I'm so glad we took the time to celebrate it! Love the barber stripe paper straws! Thanks so much for sharing! 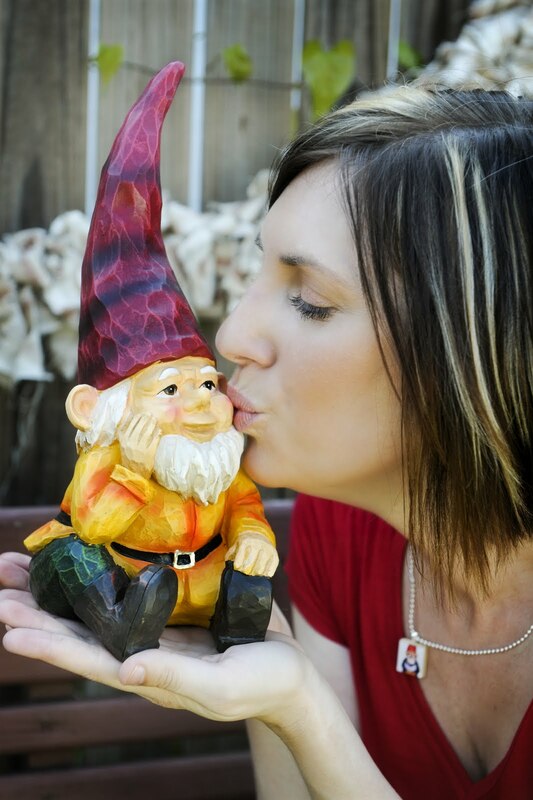 This is seriously one of the funnest blogs I have seen! So many great ideas. thank you for the shout out. 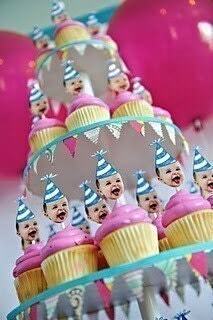 what a wonderfully fun party...wish i had been there. such great details. What a great fun party! I love all the detail about the party. Thanks for sharing and for using my vintage doilies. How very charming! 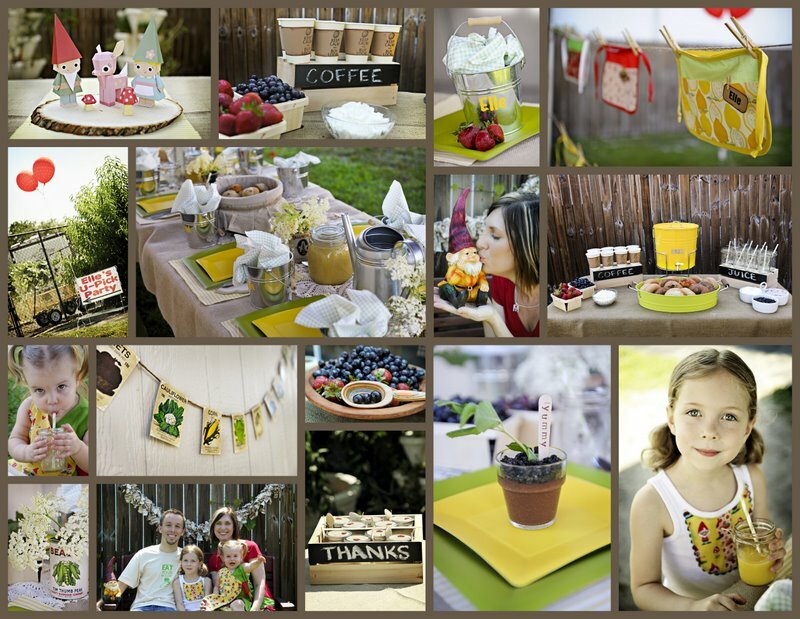 Thanks for including my berry baskets at your party! You've set the bar high here! The photomontage at the top of this post is fabulous :) I love that you hired a photographer for the party. I would never think to do that, but it makes perfect sense. No matter how good my intentions, there are never enough photos & rarely is everyone included. Such a fun, perfectly planned day, every detail - thanks for making my little strawberry mason jar labels a part of it & thanks for the props here! 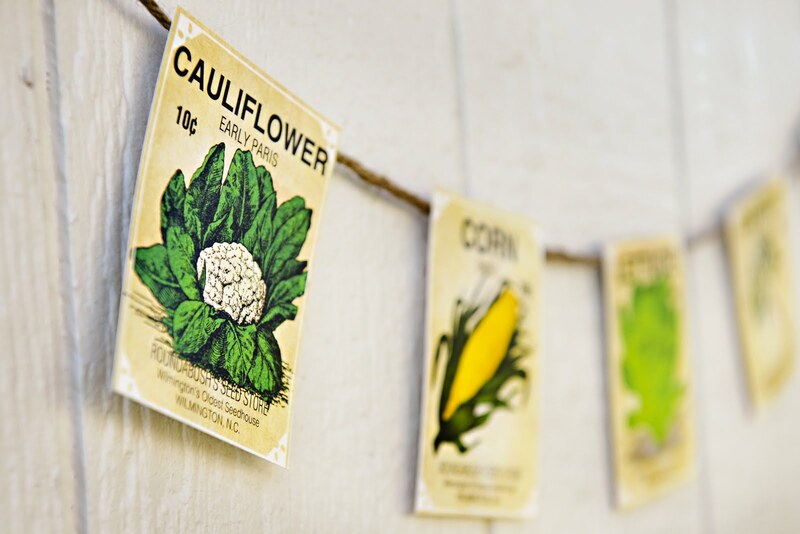 Off to make myself a seed packet garland! Fabulous party! I bet they had a great time! 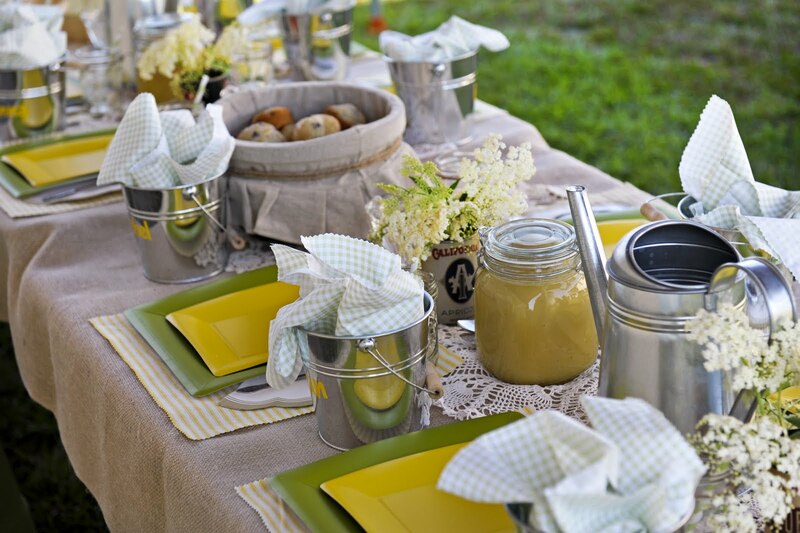 Thank you for showing my garden party invitations in your post! What a wonderful party and so full of inspiration!! Great job! Well, isn't that just the cutest thing ever. What a great party! What a beautiful party! Lucky girls!